Select the mode by pressing the Smart Parking Assist System button with the shift lever in P (Park) or N (Neutral) and the brake pedal depressed. 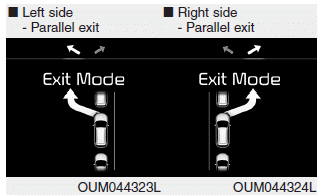 The left side parallel mode is selected automatically when the Smart Parking Assist System is activated. To select the right side parallel mode press the Smart Parking Assist System button once more. If the button is pressed again, the system will turn off.